What are the disadvantages of oil painting? Does my painting need restoring? Should I get my painting restored? Painting restorations performed by competent restorers will use restoration techniques that are completely reversible. They’ll also ensure that only the specific areas on the painting requiring retouching, are retouched. To understand more about restoring oil paintings, you first need to understand the process of painting one. Oil painting was developed in the 15th century as it offered a number of creative advantages to artists. It is produced by binding ground pigment with various types of oil such as linseed and poppy. This paint can be diluted and thinned with spirits like turpentine. It allowed the artist to achieve strong depths of colour, luminosity and tone much easier than with other mediums. Using oil paints, artists were also able to build up the painting using semi or fully transparent glazes, allowing them some of the benefits of watercolour. Each of these supports have different advantages for painting on, but the main reason these particular ones are used is because they provide a stable support to which the paint will readily adhere. In earlier years wood panels were used coated in gesso, but artists moved onto using canvas because there was a bigger size potential and the textural weave of the canvas became very popular. They also eventually replaced the gesso with lead white primers. Oil paintings are made up of a number of layers, the first (or bottom) of which is the canvas. 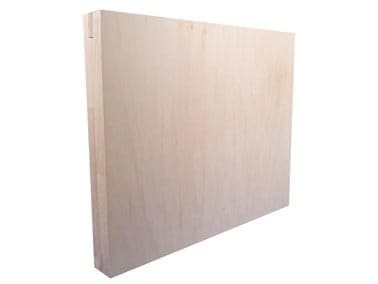 The canvas is usually made up of linen or flax which has been primed with glue to reduce the absorbency of the canvas before it’s been primed. It’s then stretched over a wooden frame, which allows wedges to be attached allowing the canvas to be retensioned over time. Then the canvas is primed, this is the second layer. What primer the painter uses depends on the medium they’re going to use. Lead white pigment was previously used for oil painting as the oil paint binds well with it. More recently, faster drying acrylic substances have been developed for artists to use instead. 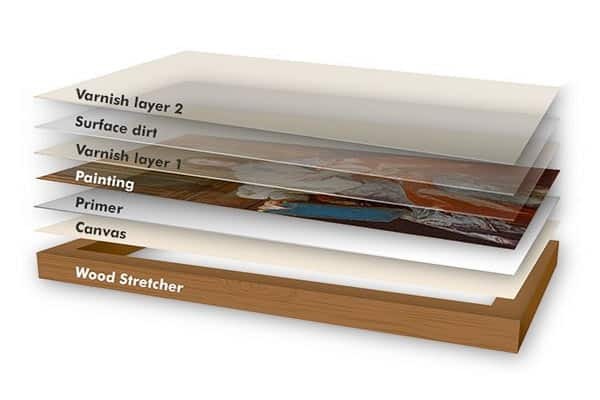 The third layer, often made up of many layers, is the oil painting itself. The longevity of the painting is often determined by the medium the artist uses and their method of application. Normally, the painting is made up of a number of thin layers painted in a number of ways to produce the desired effect for the painting. As you may expect, artists are known for experimenting by applying materials that deteriorate, such as bitumen to their paintings. These materials most certainly will have an effect on the life span of the painting. The final is varnish. Varnish is used as a top coat for the oil painting and brings all the layers of paint together as well as protecting them. Varnish can also be used to separate layers of paint and is used during painting restoration to separate any touching up of the painting that’s required, to make sure that the restoration is fully reversible for their client. In some cases, Turner can be used as a layer of varnish in between layers of an oil painting to allow fine details to be painted in with watercolours. After which, the artist generally applies more oil glazes before the final varnish coat. Sometimes, an extra layer of varnish is applied on top of a dirty painting as a way to freshen it up. As a result, many old paintings can have several layers of dirt trapped between varnish layers. Varnishing over surface dirt on a painting is not something that is advised. If your painting gets dirty you’re much better off getting your painting cleaned and replacing the top layer of varnish if required. Whilst oil painting offers artists a large scope to experiment, they can cause restorers problems and the artist’s work has the potential to rapidly deteriorate. Using particular minerals experimentally to create effects have been known for obliterating whole areas of a painting surprisingly quickly. In the 19th century bitumastic was used as a glaze to create an amber glow, however later on it formed lumps and cavities in the oil painting, such as those on the surface of the moon. Chrome yellow was another popular one used by Vincent Van Gogh which eventually made the painting’s colours fade and in some cases disappear entirely. Despite all of these disadvantages, oil paintings generally still age better than water-based paintings. We often get asked by our clients if a painting is worth being restored, and at the end of the day that decision is up to you. However, wouldn’t you like to be looking at your painting, looking its best? Wouldn’t you like to conserve it so that generations of your family can enjoy it for years to come? A restorer’s job is prevent the destruction of a painting for as long as possible, but whether the tests of time are acceptable on your painting is entirely up to you. In the world of art conservation arguments are constantly raging as to what extent artwork should be restored. By restoring artwork are we losing some of the art’s inherent history? Despite these arguments, the effects of age or a poorly cared for painting can be reversed and reveal the painting back to near enough its original state. To many painting owners, the effects of the condition of their oil painting over the years will seem imperceptible. Paintings gather dust in the same way as the curtains and the walls in your home. If you remove your painting from your wall, and it leaves a pale rectangle where your painting once was, that will give you a good indication of the surface dirt your painting has acquired since being put there. Similarly, if it leaves a darker colour, that will indicate the damage that the sunlight may have caused to your oil painting. The varnish of the painting is also affected by the same conditions that the painting itself is, most commonly atmospheric conditions, changes in temperature, humidity and sunlight. Over a number of years the varnish will become cloudy and yellowed or discoloured. Bloom, known as cloudy or dull spots, can develop due to moisture in the air or the painting may even begin to look frosted or milky. If this is the case, most oil painting restorers would recommend cleaning the painting and replacing the varnish, the results of doing so can often be miraculous. Cracks on oil paintings can also appear as a result of ageing. They can appear in the most incredible formations on the surface of the painting. Whilst ageing is the most common case for this, these cracks, sometimes known as craquelure, can also be caused by interactions between the canvas and the layers of the painting. Whilst the binding agent used to create the paints will probably be consistent throughout the painting, the different pigments used to colour the paint will contain different minerals which will expand and contract in different ways over the painting’s lifetime. These movements will create cracks in the layers of the painting as well as the varnish. A worst case scenario of this would be for the paint to come away from the canvas, which is absolutely terrible, but is also fully restorable. In some cases, restoration can appear to be miraculous, especially if the owner of the painting has never seen it in anything near to its original state. The accumulative effect of the painting’s age and the varnish discolouration can be imperceptible to an untrained eye. So when the owners see their paintings after the restoration process, they do look, in some cases, like new. When an oil painting is cleaned, the restorer carefully identifies the cause of the deterioration or discolouring of the painting and then treats and removes the varnish layers. A layer of varnish is applied and any missing pigments of paint are carefully touched in. Once it’s dry, the painting is then varnished once again. Their use of solvents and chemicals used within the trade. All of these factors create the need for an oil painting to be restored. The restorers main job when restoring an oil painting is to preserve and maintain the oil painting to as close to its original state as possible for as long as they can. Conservation is the prevention of deterioration of oil paintings. Restoration on the other hand is renovating and returning the painting back to as close to its original condition as possible. Restoration uses a lot of conservation techniques, so in some cases restorers prefer to refer to their work as conservation because of the way it’s interpreted. However, in museums, conservation stays closer to its true meaning. They conduct research into reviving damage and slowing the deterioration of their paintings, as well as constantly monitoring them under optimum conditions to prolong their life. Privately owned paintings rarely receive such high quality care other than when they’re taken to a commercial conservation or restoration studio. When the canvas of an oil painting becomes ripped or torn, the canvas needs re-lined. Sometimes the damage only requires a patch, but in other cases the whole painting can need re-lining. When an oil painting has been severely neglected, this can result in the canvas being torn in many places and areas of the paint being lost. In order to save the painting, the first thing a restorer would do is apply facing tissue onto the surface of the painting to hold any loose paint or tears in place. The painting is then removed from its wooden stretcher and a heat sensitive glue is used to attach a new canvas behind. 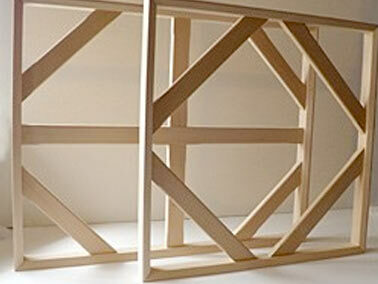 This new canvas is already attached to its own wooden stretcher frame before being attached to the original canvas. Once heat is applied, the glue passes through the canvases and the layers of paint, securing the whole painting. Once the glue is dry, the tears and areas of missing paint are then consolidated from the front. The important thing to remember when it comes to your oil painting, is that the best care in the world cannot stop the deterioration of the painting. However, proper conservation and restoration when required, can definitely dramatically decrease the time in which it occurs.